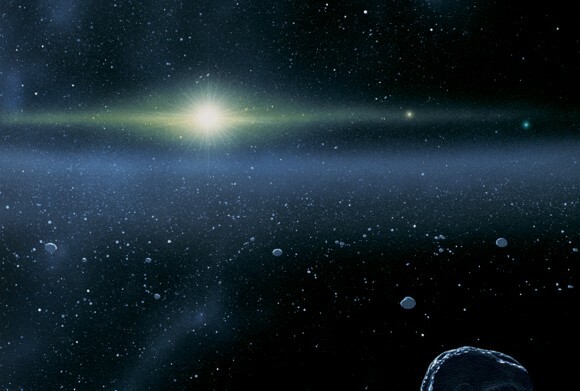 In the past two decades, exoplanet hunters have discovered almost 1800 planets beyond the Solar System, and there is more than twice that number of potential candidates still awaiting further confirmation. Of the known alien systems, astronomers have found a substantial number of planets travel around their parent stars in truly unusual orbits, unexplainable by any planetary formation mechanism. The list of peculiar cases includes bodies that travel along completely different orbital planes to one another, worlds that take millennia to complete an orbit, and those that possess extreme comet-like eccentricities. Even more extreme are the rogue planets out there that orbit no star, presumably having been ejected from their solar systems altogether. However, the most inexplicable bodies are hot Jupiters, which orbit their parent stars in a matter of hours to days at a fraction of the distance that Mercury lies from the Sun. At such close proximity to the star, temperatures would simply be too high for a massive planet to retain its gaseous envelope during formation. If these bodies cannot have formed at their current locations this may mean that planetary orbits are subject to dramatic change throughout the evolution of a system; meaning that where we observe a body now may not be where it formed, or where it will eventually end up. This reordering is referred to by scientists as planetary migration. There are three ways in which planetary migration is understood to occur: the first describes a gas driven process in which the planetary disk effectively pushes or pulls the planet to a new position; the second arises as a result of gravitational interactions between neighbouring bodies, where a large object can scatter a smaller one and thereby create an equal and opposite resulting force back onto itself; and the third is due to another gravitational effect, tidal forces, which mainly occur between the star and the planet and tend to result in more circular orbits. Surprising as it may seem to some, it is widely accepted that planetary migration has shaped and influenced the architecture of the Solar System quite dramatically. In fact, its dynamic past actually explains the existence and properties of several Solar System entities, and shows that our planetary system might not be as unique as once thought. 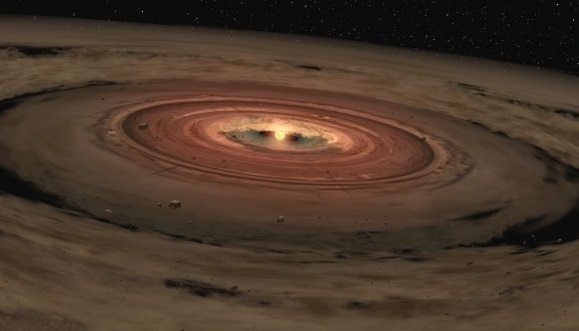 So how have the planets moved since their birth? It all began with the inward migration of the largest planet in the Solar System, Jupiter. The gas giant, weighing more than all the other planets combined, is believed to have travelled right up to the orbit of Mars, 1.5 AU from the Sun, before travelling back out to its present location almost four times as far. Luckily for Mars this occurred some 600 million years into the birth of the Solar System (around 4 billion years ago) before any of the terrestrial planets had formed and only four gas giants ruled the skies. At this time, Jupiter, Saturn, Uranus and Neptune possessed much more compact orbits and were surrounded by a dense disk of small icy objects. 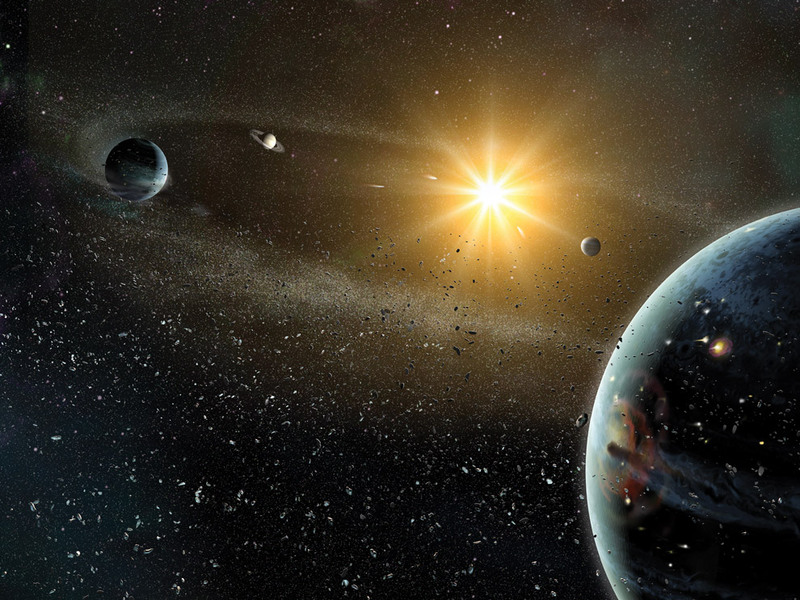 Artist impression of planetary system. Image credit: Dana Berry, Harold Levison, Dan Durda, SwRI. Jupiter was drawn towards the Sun by the first type of planetary migration, gas driven, whose effects work differently depending on the mass of the planet. For low-mass planets, like the Earth, the mechanism occurs when the planet’s orbit perturbs the surrounding gas or planetesimal disk driving spiral density waves into it. An imbalance can occur between the strength of the interaction with the spirals inside and outside the planet’s orbit, causing the planet to gain or lose angular momentum. If angular momentum is lost the planet migrates inwards, and if it is gained it travels outwards. This is known as Type I migration and occurs on a short timescale relative to the lifetime of the accretion disk. In the case of high mass planets, like Jupiter, their strong gravitational pull clears a sizeable gap in the disk which ends Type I migration and allows Type II to take over. Here the material enters the gap and in turn moves the planet and gap inwards over the accretion timescale of the disk. This migration mechanism is thought to explain why hot Jupiters are found in such close proximity to their stars in other planetary systems. The third type of gas driven migration is sometimes referred to as runaway migration, where large-scale vortices in the disk rapidly draw the planet in towards the star in a few tens of orbits. The three types of disk migration. Image credit: Frédéric Masse. The best understanding of how the planets have moved in throughout our system’s evolution arose from the Nice Model, proposed by an international collaboration of scientists in 2005. This model suggests that at the inner edge of the icy disk, some 35 AU from the Sun, the outermost planet began interacting with icy planetesimals, influencing the second sort of migration to occur: gravitational scattering. Comets were slingshotted from one planet to the next, which gradually caused Uranus, Neptune, Saturn and the belt to migrate outwards. Jupiter’s powerful gravity flung the icy objects that reached it into highly elliptical orbits or out of the Solar System entirely, which in order to conserve angular momentum, further propelled its journey inwards. An extension to this theory is the ‘Grand Tack model‘, which is named after the unusual course of Jupiter’s migration towards the Sun before stopping and migrating outwards again, like a sailboat tacking about a buoy. At the distance that Mars would later coalesce, material had been swept away due to Jupiter’s presence. This resulted in the stunted growth of Mars and a material-rich region from which the Earth and Venus formed, explaining their respective sizes. The gas giant’s travels also prevented the rocky material in the asteroid belt from accreting into larger bodies due to its strong gravitational influence. Although Jupiter swapped positions with the asteroid belt twice the movements were so slow that collisions were minimal, resulting in more of a gentle displacement. The Nice Model, Gomes et al. 2005. But why did Jupiter’s migration to the Sun’s fiery depths cease? For that it has Saturn to thank. As the two planets moved further away from each other, it was believed they became temporarily locked in a 2:1 orbital resonance. That meant that for every orbit of the Sun Saturn made, Jupiter made two. The Nice Model showed that the planetary coupling increased their orbital eccentricities and rapidly destabilised the entire system. Jupiter forced Saturn outwards, pushing Neptune and Uranus into extremely elliptical orbits where they gravitationally scattered the dense icy disk far into the inner and outer Solar System. This disruption in turn scattered almost the entire primordial disk. Some models also show Neptune to have been propelled past Uranus to become the farthest planet from the Sun as we now know it. Over time the orbits of the outermost planets settled back into the near circular paths we observe today. The Nice Model explains the present day absence of a dense trans-Neptunian population and the positions of the Kuiper belt and Oort cloud. It also accounts for the mixture of icy and rocky objects in the asteroid belt, like water-rich dwarf planet, Ceres, which likely originated from the icy belt. The rapid scattering of icy objects, around 4 billion years ago, dates with the onset of the late heavy bombardment period, which is predominantly recorded from the Moon’s well-preserved surface. However, there are problems with the original Nice Model, where some simulations found that the gradual 2:1 resonant coupling of Jupiter and Saturn would have resulted in an extremely unstable inner Solar System from which Mars would have been ejected. Later research has since resulted in the ‘Nice 2 Model‘, which in part suggests that the gradual scattering of planetesimals caused the two gas giants to fall into a 3:2 orbital resonance (not the originally proposed 2:1), allowing for the Nice Model to work with a stable inner Solar System. The final mechanism for planetary migration occurs through tidal interactions between different celestial bodies. Unlike gas driven migration and gravitational scattering, tidal forces act over a much longer timescale of billions of years. The process begins due to the Kozai mechanism, which is suggested to pump eccentricity into a planet’s orbit. As the tidal forces correct this effect by re-circularising its orbit the planet moves closer in. Whilst the orbits of the terrestrial planets are thought to have remained fairly stable throughout the evolution of the Solar System, this gradual process is likely to have slightly altered their paths and will remain to do so. The knowledge of how our own planetary system evolved has helped answer many questions about unusual exoplanet orbits, but there is still a lot left to uncover. One such question asks why we observe so many hot Jupiters unfathomably close to their star, as without another large body’s influence, should it not eventually be swallowed up? Perhaps planet-disk interactions decouple at such close proximities to the star and tidal forces prevail, or perhaps we are capturing a snapshot in time just before the planet meets its fate. For now only time, further observations and, most importantly, more exoplanet discoveries will tell!